As a young man Grant hated working in his father’s leather business. He didn’t especially want to go to West Point either but thought it a better alternative to manufacturing. The “S.” in his name was a typo made on his application to West Point. Grant kept the initial and was affectionately known as U.S. Grant during the Civil War. Although West Point graduates were in demand, Grant had a tough time getting a position in the army due to his heavy drinking. His talents outweighed his faults, however. Grant was the first man since George Washington to earn the permanent rank of lieutenant general. That rank gave him the responsibility for the Union’s strategy. Though he was a hero to Northerners at the end of the war, Grant still had to earn a living. With a family to support, he reluctantly went to work for the family leather business. In 1868 Republicans and Democrats both wanted the hero of the Civil War to run for president. He ran as a Republican. Though he was a great leader during the war, Grant had no political experience. It’s one thing to fight a war with a clear enemy–quite another to determine who one’s enemies are in the game of politics. Grant’s greatest problem as president was his trusting nature. Though honest himself, he surrounded himself with others who were not. He also felt inferior to intellectuals and tended to follow Congress’ lead. As a result his presidency was marked by multiple scandals. For example, his secretary of war was accused of accepting bribes from merchants who traded at army posts with Native Americans. After two terms in office the administration’s scandals prevented him from trying for a third term. His trusting nature failed him again when he became a victim of Wall Street fraud. Knowing that Grant was broke, his friend Mark Twain suggested that he write his memoirs in order to make money. Grant had just started writing when he developed throat cancer. He was determined to finish his memoirs before he died, however, and they are still selling today. Unsurprisingly, they focus on the time period that brought Grant the most success: the Civil War. 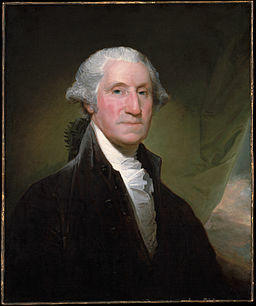 The third President of the United States had a personality that was similar to George Washington’s in many ways. Like Washington, Jefferson was fond of dancing at parties and tended to be shy. Instead of addressing Congress in person, Jefferson sent his messages in writing. This tactic showed off his writing skills and helped him avoid his fear of public speaking. Known as an intellectual for his scientific and architectural pursuits, he thought he was also a good violin player, though some people who heard him play thought otherwise! Official dinners were conducted in a manner different from the presidents who preceded him. He insisted on dressing simply to the point that one guest thought he was a servant. The dinners were served on a circular table so that no guest would feel superior or inferior to another. Jefferson did not eliminate all luxury in the executive mansion, however. Fancy French food was served regularly during his presidency. As many people know, he sent Meriwether Lewis and William Clark to explore “Louisiana country” west of the Mississippi River. Jefferson and Lewis had been neighbors in Virginia, so Jefferson already knew how seriously Lewis would take the job. With Lewis and Clark’s help Jefferson purchased the Louisiana territory. While Jefferson added land to the United States, he also scaled back on some government departments. In a move that would delight many people today, he temporarily got rid of the Internal Revenue Service. Like his close friend Jefferson, James Madison also tended to be shy in public. Madison had the additional disadvantage of being the shortest president in history (he was 5’4″). He was also one of the skinniest, which led some people to believe he was always at death’s door. His personal qualities may not have made him noticeable to others, but his wife Dolley made up for Madison’s awkwardness. The outgoing Dolley was Thomas Jefferson’s hostess while the widower was president. This gave her opportunities to mingle with members of Congress who would decide whether or not to elect Madison when he ran for president. When Madison was elected, he and Dolley held the first inaugural ball at a hotel on Capital Hill. In many ways Madison served as Jefferson’s junior partner. He kept Jefferson informed of political matters in the states while Jefferson served as minster to France by writing coded letters to his mentor. Madison told Jefferson, “I shall always receive your commands with pleasure.” Yet Madison had his own opinions. While Jefferson was away, Madison helped draft the U.S. Constitution. 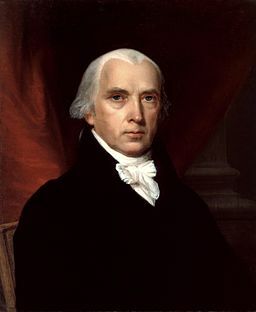 His belief in a strong central government ran in opposition to Jefferson’s preference for individual rights. Madison did, however, have a flexible personality, which allowed him to see both sides of an issue. Just as he helped write the Constitution, Madison helped create the Bill of Rights that supported Jefferson’s individualistic views. Peggy Shippen grew up in an upper-middle class family in Philadelphia that didn’t support the American colonies’ complaints about Britain. Her father, Edward Shippen, believed that ordinary citizens could not govern without the upper classes telling them what to do. Her father found himself in a sticky situation when the Continental Congress met in Philadelphia to discuss how the colonies should respond to Britain’s taxes on America. For a while, the Shippen family left their home for a place in the country. Peggy resented having to leave her fashionable lifestyle behind. By 1774 she was a teenage girl who was about to make her debut into Philadelphia society, but her father believed it was best to leave so he wouldn’t be forced to take sides in the debate. In 1777, the Shippens returned to their family home. The American Revolution had already started, and the British captured Philadelphia. Peggy and other young women flirted with the British officers and enjoyed dances and parties. One observer said, “all the young men are in love with Peggy.” Eventually the British left Philadelphia for New York, and American general Benedict Arnold was appointed as the city’s military governor. The ever-practical Edward Shippen welcomed him. Though he was twenty years older, Arnold soon fell in love with Peggy. Before their marriage, Benedict Arnold had career problems. He was charged with crimes against the army, including treating minor officials with disrespect, using public wagons for private property, and showing favor to Loyalists who disapproved of the revolution. Arnold felt bitter that Americans did not appreciate his skills or the fact that he was lame as a result of fighting in battle. Though most of the charges were dropped and George Washington offered him a job as his number two general, it was too late. By then, Arnold and his wife were spying for the British. No one knows whether Peggy suggested they hand over information about American troop positions and guns to the British, or whether Arnold was the first to bring it up. Regardless, Peggy and Arnold were complete partners once they committed to spying. In fact, one of Peggy’s former British acquaintances, Major Andre, became the recipient of Arnold’s letters in Britain. While Arnold supplied the military information, Peggy wrote and received the letters. She used a secret code and invisible ink to hide the contents of the letters. Major Andre held the letters up to a flame or poured lemon juice on them to read them. Using these methods, the Arnolds gave the British the information they needed to capture Charlestown, South Carolina. As they gained success, Arnold negotiated a price the British were willing to pay for information about the New York fortress West Point. If the British had West Point, they could cut off communication between New England and the Congress at Philadelphia. Arnold asked to command West Point so he could tell the British when to strike. An unsuspecting George Washington gave him the job. In September 1780, a British warship was prepared to attack the fort. Unfortunately for the Arnolds, American soldiers ruined their plan with the capture of Major Andre. When the soldiers searched him, they found papers on him that revealed the plot, but did not mention Peggy’s involvement. Arnold escaped on a British barge, leaving his wife behind to defend herself. She pretended to be shocked by her husband’s actions and acted hysterically. Luckily for Peggy, few men, including Washington, thought women were smart enough to be good spies. Washington and others also completely bought her act, and even felt sorry for her. Eventually, she rejoined Arnold in London, where she lived on money gained from her war activities. In 1790, the United States Congress decided that a new capital city should be built to accommodate the new federal government. Virginia and Maryland offered land along the Potomac River, but there were no buildings on the site. President George Washington took a personal interest in the planning for the Capital and the President’s House—the place where all future chief executives would live. 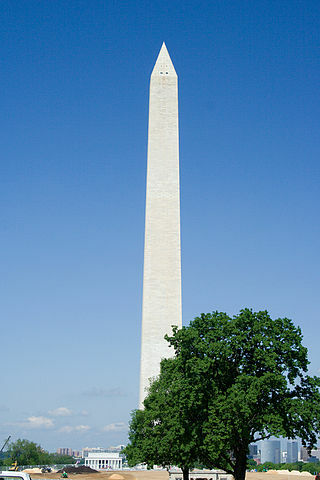 After firing the first architect hired to construct the house, Washington agreed to hold a contest for the best design. Ads in the major newspapers stated the requirements for the President’s home and promised payment of $500 to the winner. Though no architecture schools existed in America yet, the design of James Hoban, an Irish immigrant who already designed state buildings in South Carolina, caught Washington’s attention. The design called for a three- story house with stone columns in the front. Other features included large windows and high ceilings. Washington wanted the home to be grand enough for European rulers to admire it, and he thought Hoban’s plan met that requirement. The President also believed the United States would become a great country, and its leader needed a house that could grow with the increasing power of the nation. “It was always my idea, that the building should be so arranged that only a part of it should be erected for the present, and…to admit of an addition in the future as circumstances might render proper,” Washington later wrote. Hoban’s box-like design with wings that could be expanded later was a perfect match. Though Washington put Hoban in charge of the construction site, he remained so involved with the project that Hoban never made any changes without consulting him. One design element Washington insisted on was that the exterior of the house be made of stone. Though Hoban found just enough stone for a scaled down, two-story version of the original plan at Aquia Creek in Virginia, one problem remained. The sandstone from the creek absorbed water easily, which caused the stone to weaken. Hoban ordered his workers to apply a thick coat of white paint to the exterior walls. As work continued, people living in the area referred to the building as the White House—a nickname that eventually stuck. 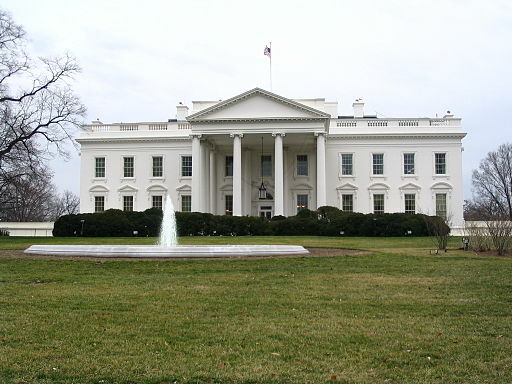 By 1796, workers completed the interior walls of the White House. Stonemasons brought in from Scotland hand-carved flowers, medallions, and other decorations around the entrance and windows. Two years later, a roof was added. The year 1800 was the deadline for the project’s completion. By then, John Adams was President and he moved in with his wife. Despite the grand exterior, the thirty inner rooms of the house were not complete. Abigail Adams wrote “Not one room or chamber is finished of the whole. 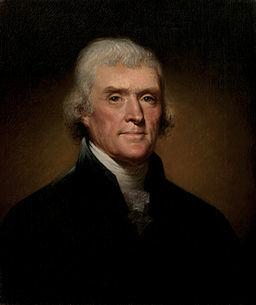 It is habitable by fires in every part, thirteen of which we are obliged to keep daily, or sleep in wet and damp places.” In a few months, the Adams’ moved out when Thomas Jefferson became President. He and the next occupant, James Madison, made the inner rooms of the White House more comfortable. Unfortunately, during the War of 1812 British soldiers burned the White House and everything inside was destroyed. A rainstorm helped preserve the exterior of the house, however. James Hoban was summoned to help with the rebuilding process so that the White House would look almost the same as when it was first constructed. Throughout his life, Benjamin Franklin had a tendency to change his mind on political issues. For example, he initially supported the Stamp Act and only later decided that the American colonies should separate from Britain. Yet often Franklin ended up on the winning side of an argument, even if the argument was not settled in his lifetime. Like his opinion of the American Revolution, Franklin’s views on slavery changed, too. He owned a couple of slaves at various times of his life and published ads for slave auctions when he worked as a printer. Still, he and his wife Deborah made sure that their slaves received an education from a Philadelphia school for black students. Most slave owners didn’t think slaves could learn, but after Franklin visited the school he commented that he had “higher opinions of the natural capacities of the black race.” He also published a few articles arguing against slavery. Until 1787, however, Franklin never gave the abolition of slavery his complete support. By 1787, the year of the Constitutional Convention, Franklin became president of the Pennsylvania Society for Promoting the Abolition of Slavery. During the convention, he sought to include a statement about the freeing of slaves in the U.S. Constitution. Like many of the Founding Fathers, however, Franklin feared that the union between northern and southern states would not be created if he argued too forcefully for the end of slavery. Like Franklin’s fictional Algerian pirate, Congress rejected the petition to end slavery. After the debate ended, George Washington wrote to a friend, “the slave business has at last [been] put to rest and will scarce awake.” The contradiction of slavery and the promises of liberty for all Americans awoke again in the nineteenth century, resulting in the Civil War. Once again, Franklin had picked the point of view that eventually prevailed.